Makes all boats go faster. SCATT keeps hulls cleaner and efficient, reducing drag tremendously. Boats get up on plane quicker. No ugly bottom paint. Reduces fuel consumption; less drag = less fuel consumed. Top speed is faster. Keeps hulls cleaner. boats lighter, free of barnacles, algae, lake and dock scum. Makes sails water resistant, lighter, more efficient. Reduces sail damage. Prevents prop pitting. Protects fittings, etc. from electrolysis, corrosion. No ugly, poisonous anti-foul paint to discolor your boat. 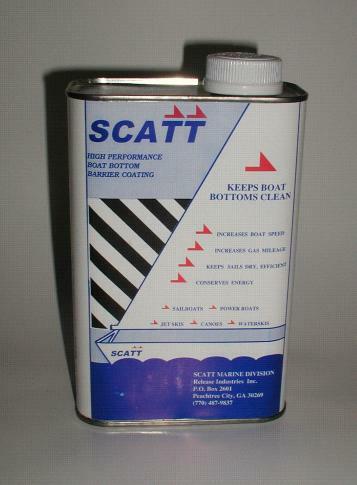 SCATT is a dry film coating which aids performance and minimizes or eliminates fouling. SCATT provides hulls and sails with a colorless, durable, water-resistant, extremely low friction surface with self cleaning anti-stick chrematistics. The film of water, which wets the surface of an uncoated boat hull (and sails) adds to gross weight. SCATT prevents this wetting, lets the surface film slide over the low friction coating, reducing drag, increasing speed, and improving maneuvering. This low friction surface minimizes adhesion of barnacles, worms, algae and dock scum; what does stick can usually be washed away with a hose, or by wave action when underway. Two coats are recommended. SCATT is applied with a trigger type spray bottle and a single application will normally last an entire season. Apply SCATT over paint, varnish, even anti-fouling coatings, after checking compatibility. SCATT is a flat, colorless barrier coat, not a polish. Use on Sailboats, Powerboats, Jet Skis, Canoes, Waterskis and more!